On the morning of your tour, head to the Ferry Building in San Francisco. Depending on the day you select, you’ll take the ferry (Mon-Fri) or a bus (Sat-Sun) from here to Vallejo, where you’ll then board a shuttle and head north to beautiful Napa Valley wine country. 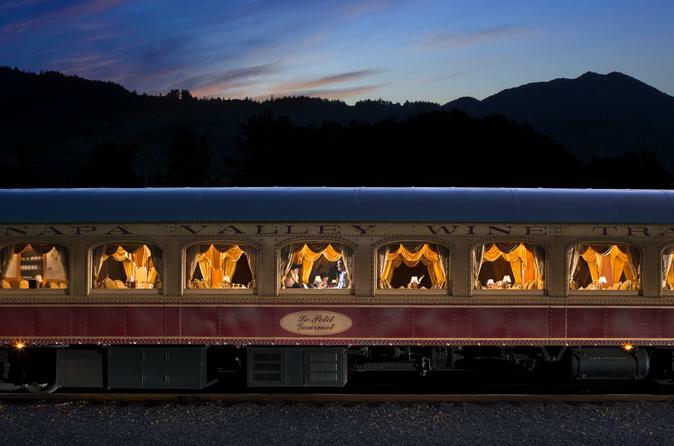 When you arrive in Napa, hop aboard the famous Napa Valley Wine Train! You'll be directed to your seat and welcomed with a taste of wine. Then, simply sit back and soak in impeccable views of Napa’s stunning vineyards as you travel north to the quaint village of St Helena, passing the towns of Yountville, Oakville and Rutherford along the way. When your eyes aren't pasted to the large viewing windows, you’re encouraged to explore this unique train during your journey – you may even visit the kitchen car to watch the chefs prepare your gourmet meal. You’ll sit in your choice of the first or second seating section, depending on when you’d like to enjoy your lunch (see Schedule & Pricing for details). Choose from a fresh, seasonal menu, and enjoy a delicious meal prepared to your specifications (see Itinerary below for a sample menu). This highly acclaimed restaurant prides itself in using fresh ingredients and sustainable produce, as well as humanely raised meats and line-caught or farmed fish. Before or after your meal, head to the lounge car to enjoy a cocktail or glass of wine from the bar (own expense) and lounge on the loveseats. Your Napa Valley Wine Train experience will end in the early evening, when you'll board the shuttle for your return trip to Vallejo. You’ll then hop on the 5:15pm ferry to return to San Francisco.